I’ve always rather liked the Audi A7 Sportback, but was never a fan of the shape of the tail lights. They reminded me of goofy, droopy eyes. The all-new A7 Sportback fixes that—the resulting rear end doesn’t look bad! That’s the biggest different between the old A7 and the new one. To me, at least. The rest of the new A7 Sportback has all the familiar Audish lines and holes and strips of LEDs. Consistency is key, I suppose. Audi also chose to call it a “coupe” in the press release, a detail which bugs me but shall address no further. With the two V6 engines, this uses a 48-volt primary electrical system. A belt alternator starter (BAS) works together with a lithium-ion battery and achieves a recuperation performance of up to 12 kW when braking. At speeds between 55 and 160 km/h (34.2 – 99.4 mph), the four-door coupe can coast in freewheeling mode with the engine deactivated and then restarted comfortably via the BAS. The 3.0-liter V6, which is what the car will be initially launched with, produces 340 horsepower and can hit 62 mph from a standstill in 5.3 seconds. Inside, Audi gave it massage and ventilated seats up front, no doubt for sore backs and sweaty butts. 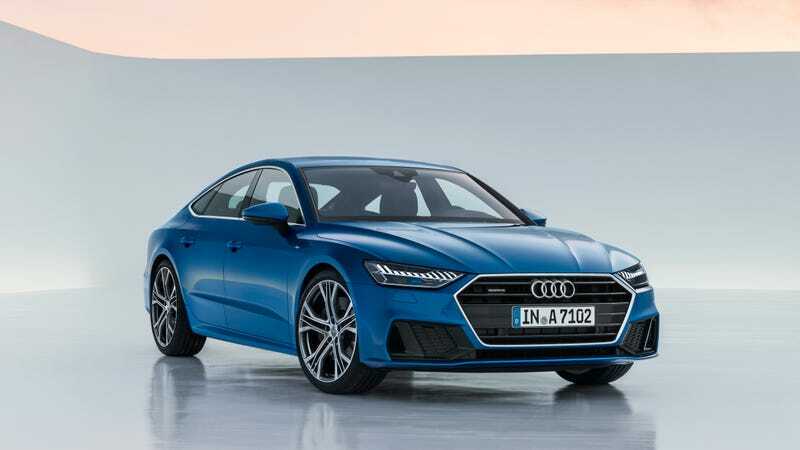 Audi says that the A7 Sportback will launch in the German market in late February 2018, with an American launch most likely to follow shortly after.